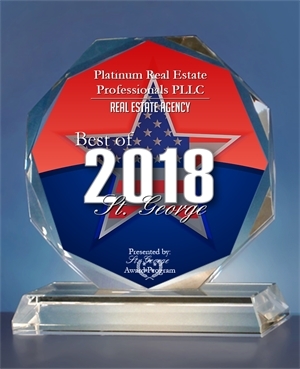 Voted "Best of St George 2018"
If you’re selling your home anywhere within the state of Utah, work with licensed real estate brokers and discount real estate agents who will save you thousands of dollars and handle EVERYTHING. Work with Platinum Real Estate Professionals PLLC! We offer full representation and listing services that save you over 40% in overall costs. But beyond our great prices and our low commissions, our real estate agents also provide great service. Our Utah real estate brokerage is known for its honest and trustworthy brokers and agents who get you the best results rather than focusing solely on their commission. © 2018 Platinum Real Estate Professionals, PLLC. All Rights Reserved.